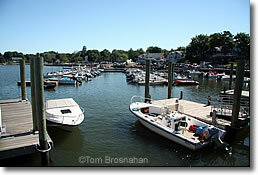 Follow scenic CT Route 146 several miles west to Stony Creek (map) in neighboring Branford CT to board a boat for a delightful cruise among the Connecticut shoreline's Thimble Islands. The aptly-named archipelago is right off the coast, and makes for a good maritime break from sightseeing on land—especially for the kids. The air is clear and cool, the waters usually calm (this is Long Island Sound, not the open ocean), the islands unusual: some are barely large enough to hold one house, others may be home to several families, and the smallest are just rookeries for sea birds. Dutch explorer Adriaen Block was the first to document the islands in 1614. Captain Kidd, the famous pirate, showed up here not too long afterwards. Bootleggers and smugglers probably used the islands as transit points. Today all is tranquil, and the islands are just for fun. Normal daytime cruises take less than an hour. There are specialty cruises (wine and cheese, sunset, etc.) as well. For lunch or summer, try Stony Creek Pizza, famous for its pizzas and sandwiches. 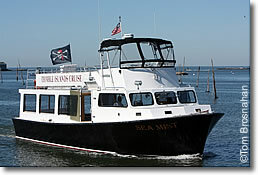 Above, Thimble Islands cruise boat.